Modelkit Panart 1:84 Construction started in 1993, after the hull was roughly built there was a break until about 2011, after which the building continued until completion in 2018. Originally I had started the model according to the blueprint. In the course of time there were more and more big differences to the right ship. 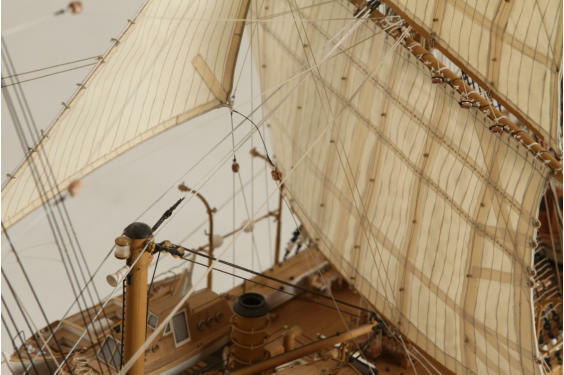 For this reason I soon deviated from the construction kit and tried to approximate the model to the original by means of further plans, pictures and other information. In particular, the rigging revealed serious shortcomings. For this reason I have redesigned the rigging of masts, yards, lines and sails. It should correspond today in large parts, as far as at the model possible, to the original. For the revised rigging a book is in progress, which will contain a detailed description with plans! After I had started with the model 2013 again, the fuselage was already finished to a large extent. Apart from some modifications and small parts, it was mainly the dinghies that took up most of the time. They had to be modified or rebuilt on the basis of our own research. A further emphasis formed the three sea-case ladders, which I represented in different superstructures, folded up for the journey and two developed variants for the mooring at the quay or for the mooring of dinghies.